The second wave ofFASL production is from newly synthesized FASL and appears on the CD8 effector cellsurface after the detection of weak antigenic signals. ApoE is one of the major lipid- andcholesterol-carrying proteins in peripheral blood, and itplays a similar role in the central nervous system, whereit is the major lipid transport protein and the predominanttransport protein for the soluble form of the ?-amyloidprotein (Mayeux et al., 1998). The recommended dosageof dofetilide is 500 ?g twice a day buy prednisone for humans but this is determined bybaseline renal function. The indi-vidual assessments of the patient are then reconciled by aconsensus process, which requires reconciliating discrep-ancies between the diagnoses of the two assessments. In PASMCs buy prednisone for humans PGI stimulates AC,thus increasing production of cAMP from ATP. The AIPs also activate these Na+ channels and,translocate them from cytosolic site to luminal membrane. Bernie Siegel asks in his book Prescription For Living,“What lifts your spirits and allows you to overcomedifficulties?” The answer is very simple: “encouragement.”Set aside a quiet time each day to contemplate your goalsand plan for the day. Cardio-pulmonary baroreceptors and baroreceptors in the arte-rial system monitor acute changes in blood pressure; thisinformation is transmitted to the central nervous systemand is used to regulate ANS responses. In other articles buy prednisone for humans the inferen-tial analysis may be described in the narrative of the Results section, perhaps with the valuesof the inferential statistics and significance levels presented in parentheses. Bilateralcanals without redness, edema, or discharge. When the shaving is cancer-free,the surgery is complete. Rows depict expression profiles of samples and columns depict signals correspondingto genes. The MRI may be ini-tially normal and should therefore be repeated in sus-pected cases of acute viral myelitides. As far as the inhibition of the most importantlymphokine (IL-2) is concerned, a study of HIV infection and the resulting loss of CD4 Tcells revealed that CD39/73 produced adenosine from Tregs and the resultant induction ofadenyl cyclase activity (cAMP production) induces the inhibition of target T cells todemethylated the CpG site1 region of the IL-2 promoter, which halts IL-2 secretion (Jenabian2013). Theselymphocytes have pale-staining nuclei and quantitativelymore cytoplasm than small lymphocytes. Note thattheproximal end ofeach stereocilium istapered and its narrow rootlets are anchored within the terminal web (cuticular plate) ofthe hair cell. Pelvic tLND is continued by adventitia stripping of the common iliac vessels. I took the month of May off… and the month of June also. Spent some “once in a lifetime” time with my daughter, helping her move to Pittsburgh. I knew I had to take the opportunity presented because it would NOT come my way again. No regrets. Got to reconnect and see her as the well established, well rounded adult she has become. And I had to write about a milestone in my Little Buddy’s life! You see the picture—Jett lost his first tooth! Yep—bottom middle tooth—he pulled it out himself! Jett said he wanted to find out what the Tooth Fairy was going to give. Apparently, at Jett’s house, the Tooth Fairy gives dollars AND cents! He got paper money and coins! That was so cool—it’s a tradition with Jett’s mom and her family. It was an exciting time—Jett lost his first tooth. 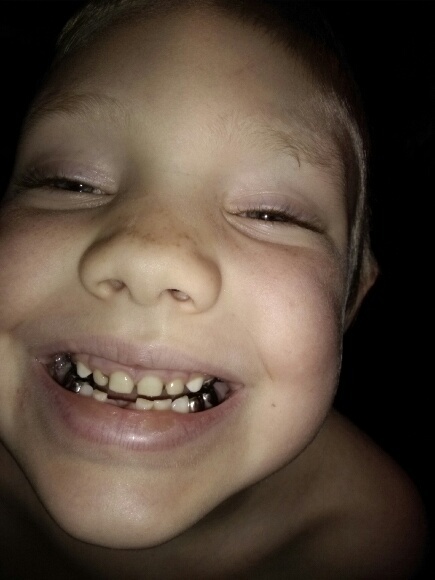 Jett is now six years old, going into 1st grade, losing his first tooth. He was just a baby a minute ago. Funny—with our kids, we get stuck in those custodial years—diaper, feed, swaddle, repeat. So much of it is just a relief that we got them from one stage to another—and we all survived it. But with our grandkids—we get to enjoy the passage of each life stage, all the firsts feel so special. And this is another first, but it’s also a last too…our little boy is moving into that next stage. This is my last time to see my grandson go another first. And it makes me a little sad…I just want to savor the moments and hold them as long as I can. Sometimes, I think Jett feels that way too. He and his sister Cali surprised me this weekend by showing up at my door unannounced. Jett asked me to get on the floor and color with him—which I obliged immediately. While we were coloring together, Cali jumped on my back and laid on top of me. But we both knew—he was probably getting too old to jump on Nano’s back and have me ride him around. He just to call it “Dinosaurs”. He wanted to ride the Dinosaur—his Nano! And that’s the part that makes me sad. As he walked around our home, Jett pointed out pics of him and Cali all around the house. It was a small picture frame that he painted when he was 2 years old—that I have displayed. I pointed to a valentine he gave me this past year…that he signed “JJ”. He told his mom that he was signing “JJ” because that’s what Nano calls him. Oh the memories we’ve made in the past 6 years! He will be too old to do a lot of things that we do with the young children. And I accept that…that’s just the way life is…they grow up and become teenagers—God help us! Getting to be his Nano. Him getting to be Nano’s Little Buddy! All I can do is share with him and Cali the love of Jesus and the stories of the Bible. That’s what this blog is for—someday, he and Cali will find this and hear me telling their stories. One can only hope—I know this Nano sure is! Nano and JettJett– Look what I would have missed! Today is my anniversary—one I don’t share with anyone—except God. Six years ago today—I should have died. Six years ago, I was in Brandon Hospital—and they were doing a heart catherization to implant the stent into my LAD. All that means is—my Lower Anterior Descending artery, the main artery of my heart, was 100% blocked—not good! That’s what my cardiologist Dr. Singh said that day. The artery was 100% blocked—and that’s why they call it the WidowMaker—people usually die when this happens. Today, it’s just about me reflecting on…how God spared me for some reason. And I’ve been given these 6 years to enjoy and experience lifetime events I would have missed, if I had died that day. Renewing my vow’s for our 10th anniversary. Welcoming the grandkids who were born after that day: Cali and Malaki and Max and Keira into our lives. Taking a few weeks to travel to Pittsburgh and help our daughter Ashley move—spending time together. Being there for my son while he does through a tough time in his life—supporting him like only a father can. Reconnecting with my forever friend Sandy, only to be there to help her family after she passed away. Being at my brother Joe’s bedside when he said goodbye to this world and hello to heaven and his daughter. Throwing this 80th birthday party for my 2nd mom, my Aunt Ciria…before she passed away 2 months later. Writing and publishing 2 books and seeing them out on the internet and having my friends read them. Being involved in the publishing world by interviewing authors for my publishers and posting on their website. Celebrating our 15th Wedding Anniversary on the Beach with our closest friends. These are just a few of the items that I would not have been able to experience IF God had not said NO! And for that, today, I just had to say…Thank you, Lord—for saving my life—for giving me these 6 years. IF tomorrow you call me home—I will still have been so grateful to have experienced so much more of my life. IF I have borrowed 6 years—I am grateful for each and every memory made—and I am honored to have shared them. It was my Lord and Savior Jesus Christ who spared me that day—and I owe HIM my life—all of my life! So I just had to let someone know—It’s good to be alive, to have the sun in my face and my family around! Because they knew—I really am not—but this too shall pass. For today—I am consumed with memories of the last 6 years, and I am overwhelmed with gratitude! Thy great salvation so full and free! My wife is not a widow—my kids are not orphaned—my friends have not lost a good friend.